Last month a seven-member panel met in the state Capitol to discuss the calamitous funding situation of the California State University system, as well as the prospects for creating free public higher education in the state. The latter idea of nationally establishing cost- and debt-free learning at the college and university levels had been popularized by Bernie Sanders during his presidential campaign last year. Yet in California, the legacy of the revenue-slashing Proposition 13, which California voters approved in 1978 to cut property taxes, remains a formidable stumbling block. At the heart of the February colloquium in Sacramento was a new report released by the California Faculty Association called Equity, Interrupted: How California is Cheating Its Future. (Disclosure: CFA is a financial supporter of this website.) Among the report’s findings is that the CSU student body rose 64 percent from 1985 to 2015, yet state funding for the system as a percent of the total general fund fell from 4.4 percent to 2.4 percent. Panelist and Assemblymember Phil Ting (D-San Francisco) stressed the practical politics of raising taxes and spending them on public higher education. Ting, who chairs the Assembly Budget Committee, pointed to November’s approval by San Francisco voters of Proposition W, which will establish free City College of San Francisco tuition for students who are city residents. It will be funded by a real estate tax on properties that sell for over $5 million. A similar proposal is on the radar in New York state, where Democratic Governor Andrew Cuomo proposed in January that residents with annual household incomes of $125,000 or less attend state colleges without paying tuition. New York’s 2011-2015 median household income—the point at which one-half is below and the other half is above— was $59,269, according to the U.S. Census Bureau. Assemblymember Phil Ting: A battle to win the hearts and minds of voters must be waged. The economic impact of the GI Bill investment, which also funded apprenticeships and job-training, in California and across the U.S., was huge. Upward mobility accelerated, according to panelist and Assemblymember Jose Medina, (D-Riverside), a retired classroom teacher who today chairs the Assembly Committee on Higher Education. “The support and the lower cost was there,” he said. Government intervention on behalf of higher education through targeted taxation and spending worked then and later, with the California Master Plan. The CMP provided free higher education to state residents at public universities, along with state and community colleges, beginning in 1960, although a decade later Governor Ronald Reagan would cut higher education spending and set the stage for tuition-based funding. “I think we have to revisit that vision of raising taxes to spend them on public higher education for the CSU,” Medina said, while Ting added that California voters are “aspirational,” and care enough about their kids’ futures to vote for taxes to hike investment in higher education. Another panelist, Robert Shireman, who is a senior fellow at the Century Foundation, spoke of another fraction of voters to sway in the battle over public opinion, albeit a tiny one: elite opinion makers on editorial boards of news media. Paradoxically, he said, many of these same elites attended well-resourced institutions of higher education, e.g., Ivy League universities, where ample private funding stands in sharp contrast to CSU’s continual disinvestment. Improving access and success in higher education does require more money, according to Shireman. For instance, he emphasized the importance of CSU libraries receiving adequate funding to keep their doors open and shelves stocked. These libraries, Shireman said, provide alternatives to cash-strapped students coping with the high cost of textbooks. Economics have intersected with demographics in startling ways for the state university system. From 1985 to 2015, the enrollment of CSU’s white students declined from 63.2 percent to 25.7 percent. At the same time, nonwhite CSU enrollment, which was 26.8 percent in 1985, rose to 62 percent 30 years later. The population of Latino/a CSU students spiked from 13.1 percent in 1985 to 37.6 in 2015, nearly tripling. Meanwhile, the African-American CSU student body has plunged significantly. One recurring theme during the CFA panel discussion was that state spending reflects policymakers’ priorities – which are revealing. California’s budget for 2016–2017 provides $14.5 billion of general fund revenue to the University of California, CSU and community college systems versus $10.6 billion to operate the California Department of Corrections and Rehabilitation, according to the Public Policy Institute. 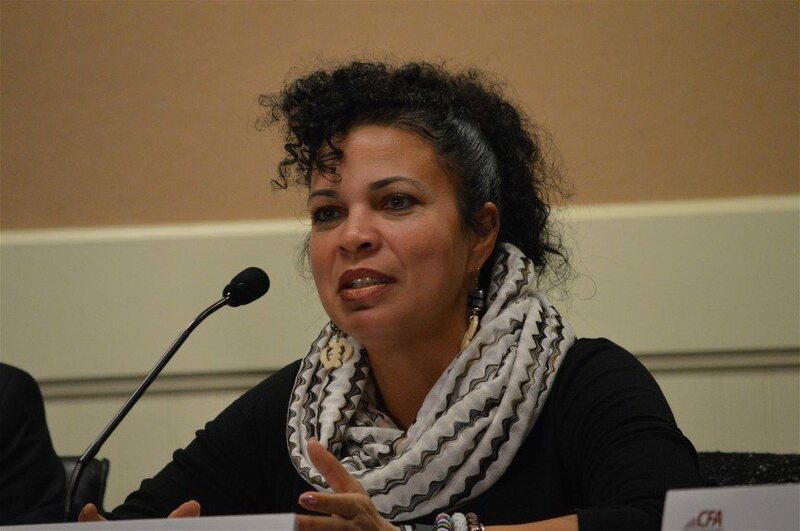 Margarita Ines Berta-Ávila, a professor in the College of Education at CSU, Sacramento, laid out the impacts of nonwhite CSU students receiving less state resources than what white CSU students got 30 years ago. For example, she shed light on why first-generation CSU Chicana/o and Latina/o students, whose family members’ lack higher education experience, seek out her and other nonwhite faculty for help to navigate the system. Too often, however, CSU minority faculty are absent on campuses because CSU disinvestment has increased class sizes, with fewer professors teaching more students, she said. 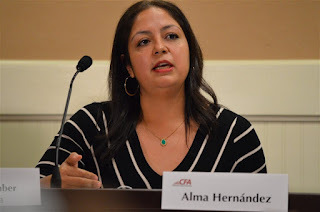 In a question-and-answer period that ended the CFA panel briefing, Berta-Ávila stressed the importance of engaging with first-generation minority students’ parents to harvest progressive policies for the CSU. Reposted from Capital and Main.